The friend party. While in and of itself, this isn’t a new experience, this year marked the first year that it was entirely up to Ezra on who to invite. Friends from school and friends from life – and none of our parental influence outside of limiting the number of attendees. This year’s theme was Pokeman (which appears popular again evidenced by a couple of other similarly aged kids having it as the theme of their party). It turns out that nobody, including the kids who love it, have any idea on what Pokeman actually is or how to play it. Ezra enjoys watching the cartoons and collecting the cards – but doesn’t actually do anything with the stuff…which is just fine by us. Outside of Lego sets, the Pokeman cards are the only thing that he collects, and that has been a fun process to witness. Pokeman cards are for him similar to what football cards were for me. It has been mentioned before, but Ahna has developed quite a knack for building amazing birthday cakes for the kids. Of course, this would be no different. She stayed up to the wee hours of the morning the night before making a ridiculous Pikachu cake and some awesome Pokeball take-home bags. Most of the last month here in Colorado has been rainy – like Pacific northwest rain at times – so it was nice that at least for the afternoon of his party the weather broke into warm sunshine. From a parent perspective, the unopposed highlight of the party was during the cake presentation/signing of Happy Birthday. 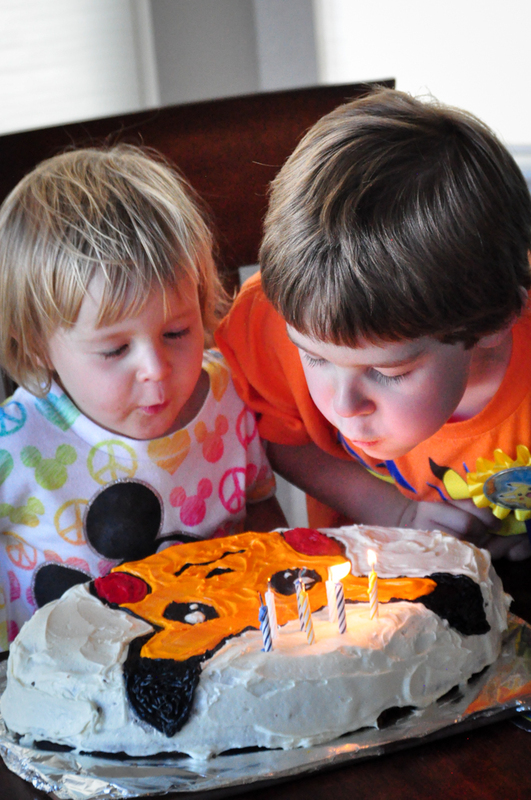 Ezra – completely unprovoked – invited Elia to join him on his chair to help him blow out the candles. No fighting, no whining…just pure kindness; and it was beautiful to watch. « Ezra – 83 Months!